When it comes to enjoying all your RV has to offer, you need to be aware of problems that can occur. Some of these problems can make for a really bad day, and RV battery issues fall into this category. With a little basic understanding, you will be able to maintain the health of your RV's 12-volt DC system and remain a happy camper. My wife Pam and I have been traveling the country in an RV for 15 years and have enjoyed full-time RV living for seven of those years. We have learned a lot of things the hard way, and some things by the mistakes of others. As we travel and talk to other RVers, we find this topic is quite difficult to grasp. There appears to be a lack of understanding of how an RV's electrical system works. And the RV battery is a big part of the electrical systems in an RV. How many electrical systems does an RV have? Your RV has three electrical systems. First, you have a 120-volt AC (alternating current) electrical system known as your shore power. This becomes active when you plug your RV into either a 50-, 30- or 20-amp power source. This electrical system will control the power needs of your major appliances and allow for charging of one or more battery systems. And, on some RVs, you can create this electrical power source from an external or onboard generator. Please be aware of the amperage requirements of your RV when choosing a shore power source. The second RV electrical system is the chassis 12-volt DC (direct current) system provided by an auto battery. This controls your tail lights, marker lights, brake lights, electric wheel brakes, engine starter motor and dash accessories. It does not matter whether the RV is a towable or a motorized unit, it still has this electrical system. It just may not be attached to the RV all the time. The third — and most important — electrical system in the RV is the 12-volt DC house batteries. This system is powered by either a six- or 12-volt DC deep-cycle battery combination. They are hooked together in either a parallel or series combination to create a strong 12-volt DC source. Now, here is where the confusion sometimes occurs. Most things inside your RV will not work without a properly functioning 12-volt DC house battery system. And this is where RV battery issues can be created because of a lack of understanding of how this system works, and its interaction with the 120-volt AC system. Stick with me here. I may be able to save you from a potential problem. In order for your 12-volt DC house battery system to function, you need good batteries as well as a way to charge them. That is where your RV's power converter is used. When plugged into shore power, this device is converting 120-volt AC power into 12-volt DC power. Think of the converter as the main 12-volt DC power system along with the house batteries, and that these batteries actually function as your backup, or the piggy bank if you will. If the piggy bank is nearing empty, then the power converter will have a hard time keeping up with the demand when many 12-volt DC systems are being used. This is when things will not work properly. When disconnected from shore power, you can run your lights, your water pump, your gas furnace and even some electrical devices if you have an inverter. This device takes your 12-volt DC power and converts it to 120 volts of AC power. But during use, the piggy bank will empty quickly without being recharged by the power converter. You need both a properly functioning set of batteries and a working power converter. Do you know where your power converter is? Do you need to in order to be sure it is doing its job? Not necessarily. Do you need to know where the house batteries are located? Yes. 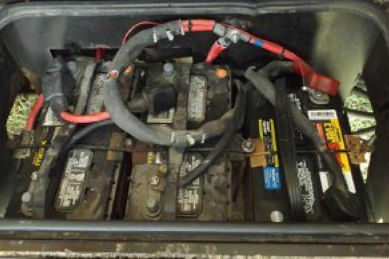 One of the main causes of RV battery issues is the lack of a proper maintenance schedule for them. They require water in order for the chemical reaction to occur in creating DC voltage. If water is not checked and added on a regular basis, the RV's house batteries will deteriorate and not allow many of the needed systems to function in the RV. Have you ever been inside your RV and the 120-volt AC power went out? Perhaps you had your lights on and noticed just as the power went out the lights also dimmed. This could be an indication of either a power converter problem or weakened batteries due to age or neglect. 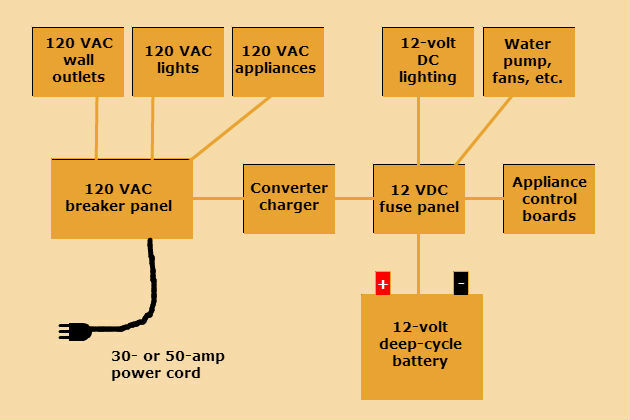 Without a properly working 12-volt DC house battery power source, RV interior lights will not work, the water pump will not function, the appliance control boards will not have the power they need to allow the gas/electric refrigerator to work, the air conditioning units to cool, the furnace to provide heat and the slide outs and leveling systems to function. Even if the RV is plugged into a 120-volt AC source, those items will not work if there is a problem with the RV's 12-volt DC house battery system. Do you know where all your 12-volt fuses are located? What can you do now to keep your lights on and appliances operating? Please, check your batteries regularly. Be sure they are at the proper water level. Some of these batteries are difficult to reach, but take the time to check them and fill as needed with distilled water. Also, clean any corrosion you see developing on the battery terminals. This will add extra resistance to the system that you do not want to have. If you know how to use a voltage meter, you can also check the house battery voltage with your RV disconnected from an AC electrical source. Compare that to a battery voltage reading with the power back on and the power converter operating. This test can reveal a lot of information about the health of your RV's 12-volt DC house battery system. 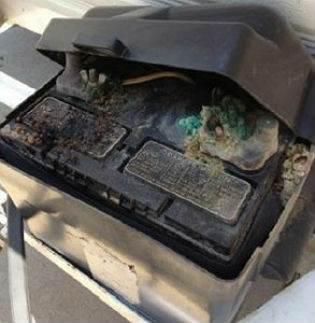 In summary, check your RV batteries regularly to avoid any issues. If you use your RV all the time, make it part of a regular maintenance program, and check them once per month. If you notice care is needed more frequently, do so. If you only use your RV occasionally, then you must be sure your RV batteries remain charged, the battery water levels are adequate and they are clean. That way, when you are ready to hit the road, so is your RV. Howard Jaros and his wife Pam have been traveling the country in RVs for the past 14 years — eight of which have been as full-time RVers. They currently run an RV inspection business out of their RV, and they work with the NRVIA to assist RV buyers and sellers by performing a type of home inspection on RVs. They provide a valuable service by helping to determine if an RV is safe, road-worthy or a possible money pit. For more information about them and their activities, please visit yourfulltimervliving.com or usedrvinspection.com.